When people tell you never to judge a book by its cover, it's usually so that you don't ignore what could be a fantastic story by passing over a dull monochrome cover on the bookshelf. They rarely tell you that the opposite can be true. That you can be seduced by a beautiful cover, deckle-edged pages and no dust jacket, even if the story inside is not one that really appeals to you. 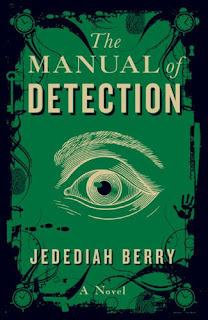 That's what happened for me with The Manual of Detection. Everything about this book is lovely. 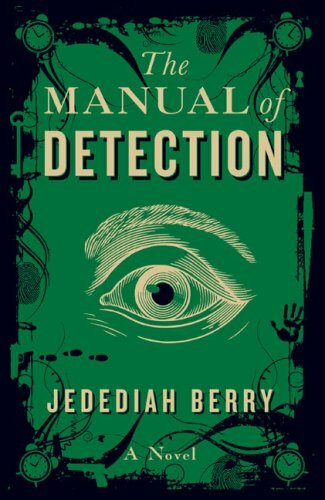 The green color, the arresting eye staring at you from the cover, the book description, and all the rest. But the story just devolves into a confusing mess reminiscent of all those nested dreams from Inception, but without Leonardo di Caprio to save the day, and it is too much for a reader - especially one reading via audiobook - to understand what's happening. The book is about Charles Unwin, a clerk for The Agency who one day finds himself promoted to detective. He is unhappy with this promotion and tries to get the clerical error fixed. But his boss's boss is dead at his desk, and it seems like to fix the error, Unwin will have to solve a mystery. Good thing he has his trusty assistant Emily the narcoleptic to help! Mystery-wise, this book reminded me a lot of the Carmen Sandiego franchise. Just like Carmen Sandiego was able to literally "steal" the show or the Eiffel Tower or the Mason-Dixon line, people in The Manual of Detection stole November 12th, the oldest murdered man (a description I still don't understand - is it the oldest man ever murdered, or the first man ever murdered? ), and other sensational items. I honestly did not understand this book. I enjoyed the first third of it a lot - the writing style is really quirky and fun and had a very film noir feel to it. But at some point, it all stopped making sense, especially in the audiobook version where I couldn't flip back a few pages to understand what level of reality/dream sequence I was on. By the fifth of eight parts on audiobook, I was ready for it to be done so that I could move on. It's unfortunate because the cover really is so pretty! But the story just wasn't a success for me. Sounds incredibly confusing, and I think that's more to do with the idea that it really is, rather than because you were confused. The cover is nice, though. I hate when books don't live up to their lovely covers! I was truly hoping your post would lead up to saying that this was a case where judging a book by its cover worked out really awesome for you. Because that is a lovely cover. It sounds like this book turned into a hot mess really quickly, and I am not sure that I would have even been able to make it through to the first dream sequence. I do really love absurdist books, but this one just sounds like it was so disorganized. I went back to my review of this from a couple of years ago to refresh my thoughts on it and I said I planned on reading it again! Perhaps it's time because I remember very little about it. I did find it to be a satisfying read though. From what I remember though, I'm not sure it would work well on audio because of the complexity. I'm sure it was a book I was flipping back and forth in! The cover is lovely indeed. Perhaps the book would've made more sense if you had the print edition to read, instead of listening to the audio version? What a shame! The cover really is pretty and the story has so much potential. I really liked Inception so this book would be perfect for me... Maybe I'd try the print version though, might be easier! That is a lovely cover, and the premise sounds very intriguing. It's a shame it was disappointing. I like quirky and mind bending .. but not just downright confusing.